Two new restaurants by the same owner have joined Pike Place Market, both classy sit-down additions to the dining scene. A year ago, restaurateurs Wade Moller and Trevor Greenwood parted ways and divvied up their properties. The three Cantinetta restaurants went to Greenwood. Moller got Chávez on Capitol Hill and Mercato Stellina pizzeria in Bellevue, along with chef Emran Chowdhury, and pasta-maker Joe Obaya, both Cantinetta alums. 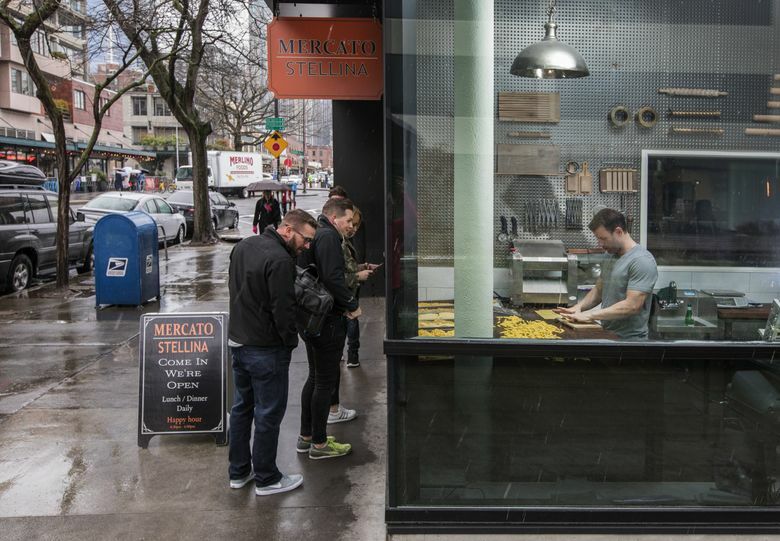 Last December, in side-by-side storefronts north of Pike Place Market, Moller’s team debuted a mini Chávez and a second Mercato Stellina, the latter showcasing Obaya’s fresh pastas, along with pizza and antipasti. 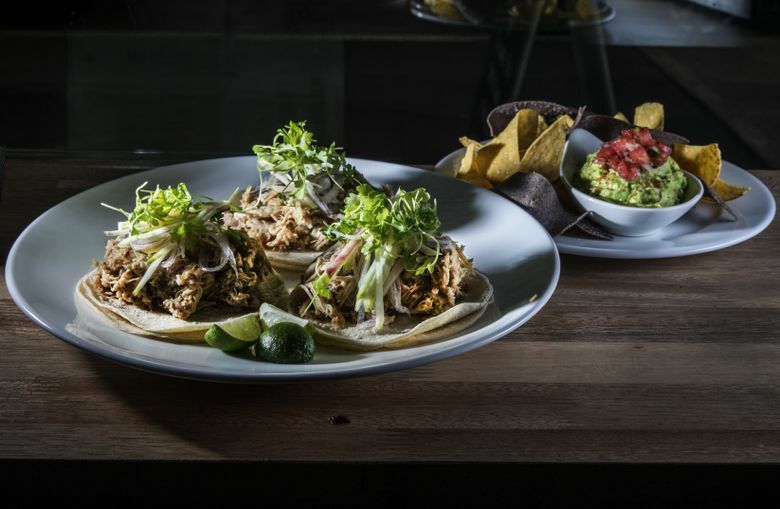 Both are classy, sit-down additions to the Market’s expanding dining scene. Seattle’s Mercato Stellina is more than double the size of the Bellevue original and flaunts the sort of cosmopolitan glam one usually associates with the Eastside. Marble, mirrors and chandeliers dress up the dining room and bar; throw pillows scattered along the dark wood banquette keep things relaxed. Enter from the Western Avenue side and you’ll find yourself in a cooking corridor. Behind the counter on the left is the open kitchen; to the right is Joe Obaya’s pastificio. Obaya started fashioning fresh noodles for Cantinetta in 2009. (He stills supplies those restaurants under a wholesale arrangement.) For years he worked in a windowless basement. Here his little pasta kitchen has a northern exposure and windows all around. It must feel like heaven. Certainly his noodles are divine and the kitchen does right by them. A chunky, spunky ragu of rapini, preserved cherry tomatoes and Uli’s hot Italian sausage couldn’t daunt hand-formed quills of garganelli. Micro celery leaves and brittle wafers of fried chicken skin festooned spoon-size tortellini filled with minced chicken and thyme. Prosciutto and Parmesan rinds bolstered the chicken broth they are simmered and served in, whereas the square-cut lengths of tonnarelli required a whole wheel of Parmigiano-Reggiano. They ignite rum in the ever-deepening hollow of the giant wheel to create a “bowl” of melty cheese that they toss the cooked noodles in. 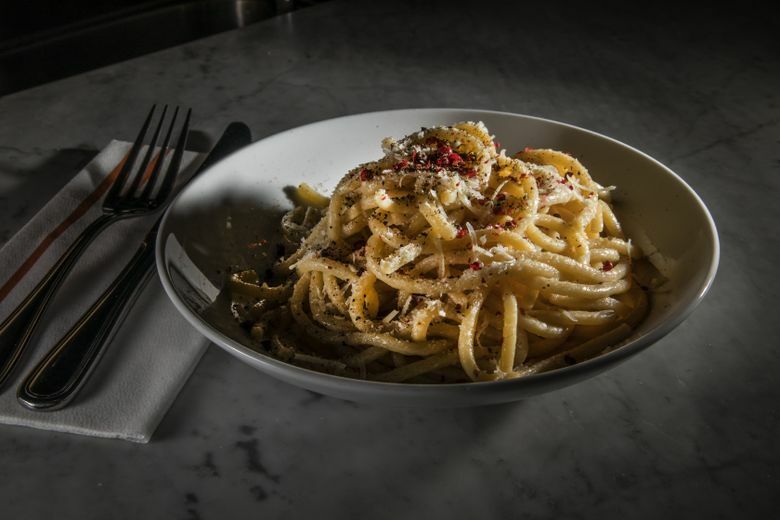 Grated pecorino and lots of freshly ground black and pink peppercorns finish this spectacular version of cacio e pepe. The Bangladesh-born Chowdhury learned that trick in Toronto early in his career. He has a mind to prepare risotto the same way when he launches weekly market specials beginning in April. If you sit at the counter, you can watch the fireworks. You can also watch Chowdhury coax pizza dough into flat, dimpled disks with his fingers. They recently tweaked the dough recipe and I think they’ve found success. The rim, liberally slicked with olive oil, emerged puffed and golden; the center crust stopped short of crackerlike crunch. Toppings range from sausage, salami and seasonal greens to the un­expectedly compelling combo of smoked king salmon with capers, onion, arugula and sriracha aioli. For starters, a splendid butter-lettuce salad is lightly dressed with orange blossom vinaigrette. The whole leaves were arranged like a bouquet with cara cara orange and avocado countering the salty punch of olives and ricotta salata. I overheard Chowdhury sell a reluctant eater on octopus, promising that it wouldn’t be chewy. In fact, I could cut those charred legs with a fork. They curled around crisp roasted fingerling potatoes and lush avocado purée jolted with piri piri sauce. For dessert, I’d forgo the dense, nontraditional tiramisu made with Nutella, amaretto and caramelized bananas in favor of the frozen bomba — mango, passionfruit and raspberry sorbets encased in a white chocolate shell. That — and the sunset-hued grapefruit Negroni — are likely to be hugely popular when weather permits use of the courtyard patio. This compact taqueria might well have been called Little Chávez. The menu is a pared- down version of the Capitol Hill original. You definitely want the guacamole, vivid and fresh, or the wonderfully gooey seven-cheese queso fundido. Both come with high-quality blue and yellow tortilla chips. Adding house-made chorizo to the queso is a smart move. All three salsas are plenty piquant: the tomatillo-based Aquacate is the mildest; smoky Diabla is the hottest; Chicatana is crunchy with dried ants. Tacos come three per order. I advise sharing. They are so heaped with fillings I could almost hear the delicate corn tortillas groaning. No, wait, that was me, groaning with delight. My favorite remains the robust, distinctly meaty deshebrada (braised beef), followed by fish tacos — although the spice-dusted rockfish (that day’s catch) got a little lost amid heaps of cabbage slaw. But really, you can’t go wrong with any of the choices, which include barbacoa, braised chicken mole, grilled shrimp and grilled poblanos. Tough grilled flank steak and too much poblano crema made the burrito a soggy disappointment, but oh, the churros, so fragile and crisp. They come as slender logs splattered with Mexican chocolate and cajeta (goat milk caramel sauce), or as ice cream sandwiches, the batter piped into rounds and filled with your choice of vanilla, chocolate or salted caramel gelato. The bar stocks nearly three dozen tequilas and mezcals. Cocktails include an exemplary Margarita, a lively Paloma and a “Mezcal Mule.” There’s a smart little wine list plus Modello, Corona, Dos Equis and Georgetown’s Bodhizafa IPA on tap. Tables are all bar-height and arranged in such a tight labyrinth it wasn’t surprising to hear glassware crashing to the floor one hectic Saturday night. Servers handled the mishap with their customary good humor. You can also chow down at the counter or along the window ledge, and soon at sidewalk tables on Western Avenue. Providence Cicero is The Seattle Times restaurant critic. Reach her at provi.cicero@gmail.com.